For proof of consumers’ expectations of espresso makers having had changed in ways that have rendered much of what worked before obsolete, we present you the Nespresso Citiz C111: coffee industry veteran Nespresso’s offering to the coffee lovers of this day and age. Among the expectations of end users now are convenience and wide range of features. Many companies have responded accordingly. Take for example the mobile device makers. Almost each month a new smartphone, tablet or phablet is launched that is more portable and features-packed than its predecessors. Nespresso has done the same with the Nespresso Citiz C111. Coming in at 14.6″ x 5.1″ x 10.9″ in dimensions, as well as weighing just 7.5 lbs (10 lbs when shipped), we trust the espresso maker could be more compact than several (if not most) of the coffee makers you’ve owned so far. As such, we believe it could fit snugly any where you’d choose to place it home; even if you have limited space. In other words, it has a small footprint, as it’s called among the coffee-loving crowd. Since many young professionals now live in apartments, we believe consumers would much appreciate appliances that won’t take up too much space. But they have to look good to please the increasingly design-conscious market, so the espresso maker’s body has been designed to have a look that balances retro and modern designs; ensuring it appeals to consumers’ contemporary aesthetic taste. No matter how stunning an appliance is, if it’s as useful as a rock, nobody would care for it. To make it truly effective, Nespresso has given the espresso maker several features that together enable coffee lovers to easily prepare great coffee at home. 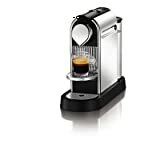 They are: easy insertion and ejection of prepared, premium Grand Cru coffee capsules; 19-bar pressure pump; and automatic, as well as programmable, coffee quantity controls for espresso and lungo. Since the espresso maker utilizes coffee capsules, operating it will be a breeze. All you have to do is load a capsule into the cartridge. The espresso maker will brew by itself. 19 bars of pressure is enough pressure for extracting as much flavor as possible, so you need not worry that you won’t get full-flavored, aromatic coffee every time. It’s also enough pressure for producing delicious crema. The rest of the useful features of the espresso maker are: quick preheating (just within 25 seconds), which ensures you won’t have to wait long for your coffee; automatic switch-off after 9 minutes of inactivity, which helps prevent any accidents; removable 34 oz (1 L) water tank that’s easy to clean; pivoting cup tray that fits even tall glasses; and dispenser that holds a maximum of 10 used capsules. According to a consumer, the espresso maker can’t generate enough temperature. He also says this espresso maker is noisy when in use. Several other consumers, however, are pleased with their models. Moreover, the espresso maker has received a perfect rating of 5 stars on Amazon. All the reviews are like having hundreds of really good friends give you their personal experience with the espresso machine, then taking all of that personal experience and giving it a star rating. You’re buying quality when there are hundreds of fans of the machine. Returns are easy. Amazon recently shipped a car, and they ship a ton of large items, all day, every day. If they can ship a car, rest assured, you will get your espresso machine in perfect condition. BUT if for any reason it comes damaged, it is super easy to return. Just print out a UPS label, slap it on the box and a friendly UPS driver will pick it up, free of charge. This is way easier than waiting in a return line at Williams & Sonoma talking with a snoody sales clerk. To survive in the coffee industry—or any industry, for that matter—one must adapt. Success depends on satisfying the market’s needs, which can change overnight. We believe Nespresso has succeeded in doing so with the Nespresso Citiz C111. We look forward to seeing what else has this coffee industry to offer in the near future.